In line with its promise to find more environmentally friendly packaging solutions and reduce its carbon footprint, Woolworths has now become the first major South African retailer to begin using post-consumer recycled plastic in foods packaging. 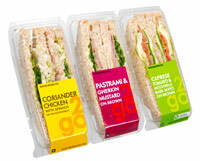 Since the beginning of September, Woolworths ready-to-eat sandwiches have been packed in containers made with 30% rPET (recycled polyethylene terephthalate) made from recycled plastic bottles. Firmly committed to its Good business journey goal to reduce the impact packaging has on the environment, Woolworths is currently working towards moving beyond the 30% mark and also plans to roll out rPET packaging to juice bottles and other plastic packaging shortly. “Not only is packaging made with rPET more ecologically sound and technologically advanced; there is no compromise on food safety,” explains Zyda Rylands, managing director of foods at Woolworths. ”The recycled PET comes primarily from locally collected soft drink and water bottles and is scrupulously super cleaned by the local supplier, who has invested some R20-million in a food-grade recycling plant and is, in fact, the first recycler in the world to be certified by the British Retail Consortium. The resulting plastic meets or exceeds international standards for food safety,” Rylands says. Woolworths says recycling one ton of PET bottles not only saves 6.2 cubic metres of landfill space; it also saves enough energy to keep a 15 watt energy-saver light glowing for 24 hours. Woolworths first began using rPET fibre several years ago for the filling in duvets and pillows. Related article: An interview with Woolworth’s “Green Warrior”, Tom McLaughlin.